"In 2002, Cobra Systems of Bloomington won a Department of Defense contract to make specialized razor wire. The contract was announced with considerable fanfare by U.S. Rep. Maurice Hinchey, D-Hurley, who wrote letters to the Department of Defense on behalf of Cobra. It guaranteed a minimum of $5 million over the next five years, with a maximum potential payout of $50 million. The ultimate value of the contract, which ends this year, is expected to be between $8 million-$9 million. The family-owned business operates a small office on Route 32 and has manufacturing plants in Lake Katrine and Newburgh, although the Newburgh plant opens only when there are enough orders to sustain operations there. In 2005 and 2006, Cobra received transactions totaling more than $2.2 million for its razor wire, much of which has been used in Iraq." 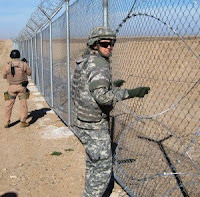 Cobra continues to get military contracts for fencing: $1,119,246 worth in 2008. Was the razor wire around Abu Ghraib made in Ulster County? Was Hinchey intentionally undermining his own stated opposition to the war on Iraq?